New Mastermind Groups Starting Soon! Do you want some accountability to help push your genealogy business forward? Tired of working in isolation? How about joining a group of peers that will support, encourage, challenge and push you forward? A Mastermind Group will do all that! Last year I started two Mastermind Groups. It was a year of adventure and experimentation. I’m pleased to be able to say that both groups have decided to continue for a second year. The participants of each group have bonded into a tight network, enjoying the support and camaraderie. With the success of these groups, I’ve decided to start a few new groups. Mastermind groups are small – limited to 10 people – and meet monthly. They are an opportunity for you to network and build relationships with genealogy professional colleagues while challenging you to grow your business. Each month you will share your successes and challenges and receive feedback, encouragement and constructive suggestions. The meetings feature a main discussion topic, sometimes including an instructional video, that provides direction in using tools such as social media, direct mail, graphics and creating a successful online bio. Other times we discuss issues of ethics within our industry or share best practices for getting your daily job done. You will be encouraged to be the best that you can be based on what you define as your goals and your personal business success. The key is having the information and know-how you need so that when you’re ready to implement new aspects of your business you have the background knowledge to make wise decisions. 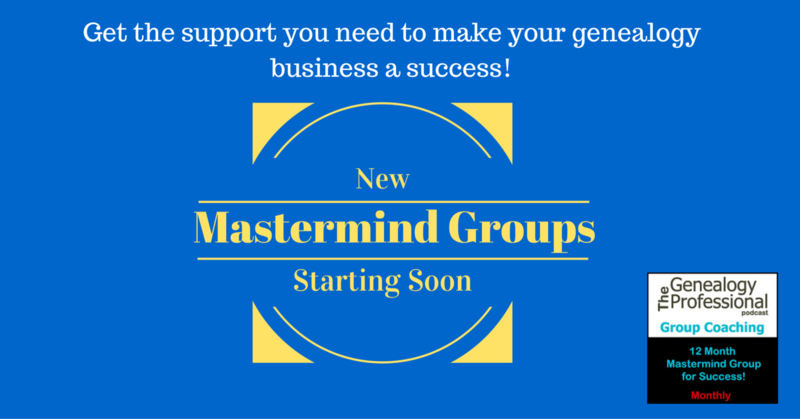 Several new Mastermind Groups will be starting in March 2016. You can find all the details here on The Genealogy Professional podcast Mastermind Page. Any questions at all, please contact Marian Pierre-Louis.